It’s Monday morning and I have escaped the curse of the crack of dawn blues by way of the sun piercing through my window and blazing its rays onto my face. I find myself in in that heady state where you can almost slightly fool yourself into believing that you are in a foreign country where the sun is an ever present friend. The sound of Bob Marley’s “Sun Is Shining” begins as I start my walk towards the train station. Once I arrive the hustle and bustle of people intensifies as the rush to get to their varied destinations becomes their only focus. The rose tinted glasses that had guided me on my journey up until this point are about to be altered to a darker shade of grey. I take out one of my headphones. The platform is overcrowded and the train is running late. The cost of train fares continue to rise while the quality of service maintains a steady flow of free fall. Looking up at the digital time table the general feeling amongst the swelling crowd is one of simmering rage resulting in anger being hurled toward this innocent innominate object in the form of steely glares. A sea of eyes watch the right hand corner of the digital display that shows the expected arrival time for the delayed train and it seems to be escalating frequently, which is then greeted by a crescendo of sighs and kissed teeth. By the time I catch the first glimpse of the train heading towards me (20 minutes late due to a “signal failure”) I realise that there are only three carriages, and you don’t have to be Einstein to work out there is a about to be a square peg being forced into a round hole situation about to go down. I take out my remaining headphone and press pause. Knocking on the carriage window I gestured to a deliberately oblivious passenger in my best dramatic sign language (ok maybe I raised my voice slightly) to convey to them that if they wouldn’t mind moving forward just a couple of paces it would enable more people to get on. My suggestion was met with compliance by the passenger although done with subtle displeasure. 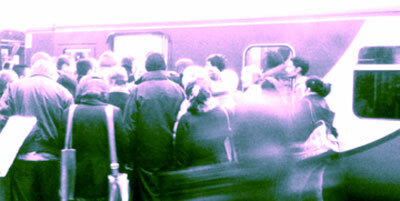 The crowd around me cheer my affirmative action and we proceeded to squeeze onto the train. Once on the train I find myself in an uncomfortable position that stretches the parameters of my idea of personal space to their very limits. Not only do I have the pleasure of someone’s hair in my face, I also have the added bonus of being underneath the hovering arm of a man who did not have the “Lynx effect”. Today it seems many people are in such a rush that they forget to take the time to consider others. By just one person addressing the situation and another taking a few steps forward it allowed many more passengers to get onto the train. When you live in a busy city, time is of the essence and sometimes you can rush past people who are in need without taking them into consideration. Whether it’s the busker singing their heart out or the pregnant woman who needs help carrying her buggy down the stairs it really does not take much to give them a bit of our time. When people pull together life’s journey becomes a far less arduous one. Please support us by making a text donation. Your text donations are free! Your network provider won’t charge you for them. 100% of your donation will be used to keep our Family Support Services running. Every Second Counts is a campaign run by Westminster Befriend a Family (WBAF) to raise funds to provide practical help and support to disadvantaged families in Westminster who are unable to cope with the debilitating problems they are going through.